Amplifier is a circuit that is used for amplifying a signal. The input signal to an amplifier will be a current or voltage and the output will be an amplified version of the input signal. An amplifier circuit which is purely based on a transistor or transistors is called a transistor amplifier. Transistors amplifiers are commonly used in applications like RF (radio frequency), audio, OFC (optic fibre communication) etc. Anyway the most common application we see in our day to day life is the usage of transistor as an audio amplifier. As you know there are three transistor configurations that are used commonly i.e. common base (CB), common collector (CC) and common emitter (CE). In common base configuration has a gain less than unity and common collector configuration (emitter follower) has a gain almost equal to unity). Common emitter follower has a gain that is positive and greater than unity. So, common emitter configuration is most commonly used in audio amplifier applications. Input impedance: Input impedance is the impedance seen by the input voltage source when it is connected to the input of the transistor amplifier. In order to prevent the transistor amplifier circuit from loading the input voltage source, the transistor amplifier circuit must have high input impedance. The range of frequency that an amplifier can amplify properly is called the bandwidth of that particular amplifier. Usually the bandwidth is measured based on the half power points i.e. the points where the output power becomes half the peak output power in the frequency Vs output graph. In simple words, bandwidth is the difference between the lower and upper half power points. The band width of a good audio amplifier must be from 20 Hz to 20 KHz because that is the frequency range that is audible to the human ear. 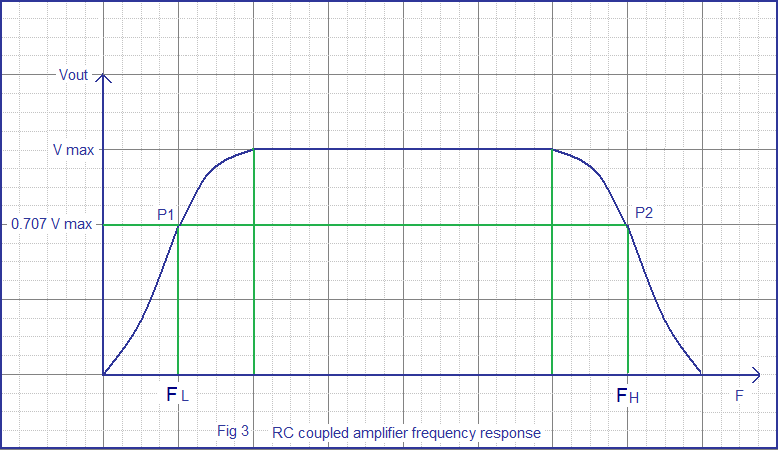 The frequency response of a single stage RC coupled transistor is shown in the figure below (Fig 3). Points tagged P1 and P2 are the lower and upper half power points respectively. Gain of an amplifier is the ratio of output power to the input power. It represents how much an amplifier can amplify a given signal. Gain can be simply expressed in numbers or in decibel (dB). Gain in number is expressed by the equation G = Pout / Pin. In decibel the gain is expressed by the equation Gain in dB = 10 log (Pout / Pin). Here Pout is the power output and Pin is the power input. Gain can be also expressed in terms of output voltage / input voltage or output current / input current. Voltage gain in decibel can be expressed using the equation, Av in dB = 20 log ( Vout / Vin) and current gain in dB can be expressed using the equation Ai = 20 log (Iout / Iin).